While our decor seems quite modern, we’ve actually tried to recreate a more traditional pub space when it comes to entertainment. It’s all about creating the ‘third space’ – a place that isn’t home or work, where you can relax, socialise and enjoy yourself. 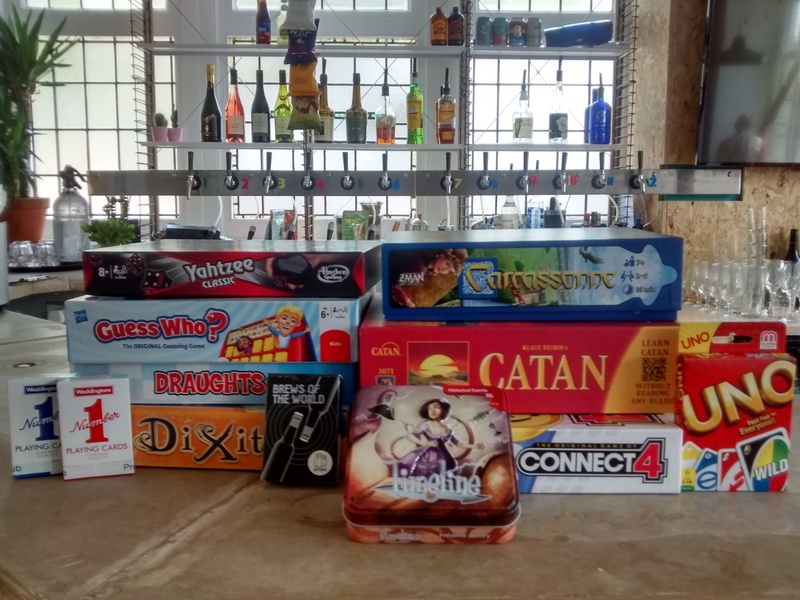 We have an ever growing range of board and card games for you to enjoy with your friends. We have a big table that is perfect for games of Carcassonne or Settlers of Catan! You’re also welcome to bring and play your own tabletop games too. The only screens we have in the pub display our live tap list, which means there’s no sports or moving images in the background to distract you from your pint and conversation. Not that small screens are verboten in our pub, we have free fast wi-fi for your enjoyment. For your reading pleasure we have an ever growing selection of independent magazines covering food, politics, culture, gardening, philosophy, travel and more. Our latest finds are scattered on tables around the pub and our bookcase is contains the full selection. Going solo? Not a problem! We’ll always do our best to make you feel welcome and if we’re not flat out busy we love a chat! But if you just want to relax with a drink and your favourite book, that’s fine by us too. We’re dog friendly! Well behaved doggos and puppers are more than welcome to join us anytime at the pub – we even have water bowls and doggy treats behind the bar. We love music so we’re often playing some groovy tunes in the background. Head over to our Facebook Events Page to see what’s coming up – from quizzes, to home brewer’s meetups to tasting sessions, we have something for everyone!